I wasn't one of those girls growing up that dreamed about her wedding. I had no idea what I wanted it to look like of what dress I was going to wear. Needless to say, when it came time to plan, I was clueless but optimistic. Fortunately, today we have Pinterest. I had been pinning wedding stuff onto an inspiration board long before we got engaged so when it came down to the details and decor, it turns out I had a theme going on on my Pinterest board and didn't even know it (boom!!). 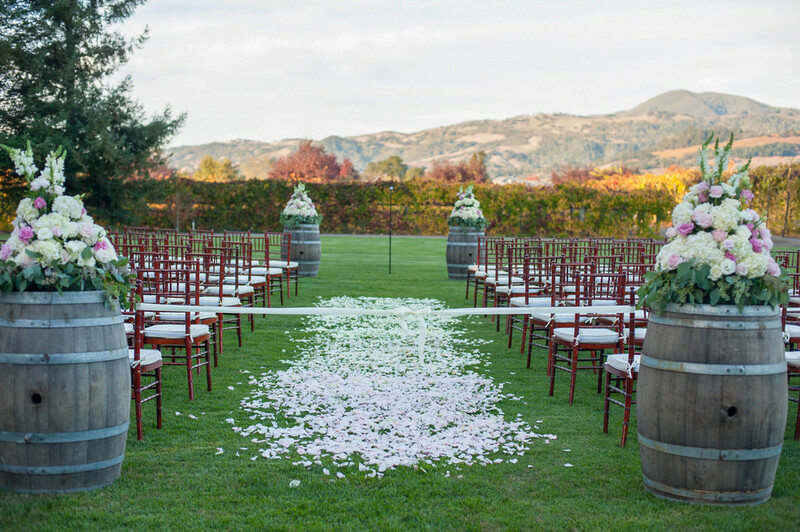 Our color palette was neutrals, champagne, dusty rose and blush with a winery, whimsical, romantic and hint of rustic feel. Flowers make all the difference to truly transform a space, so we hired Heather from Heather Hendrickson Flowers, she was local and familiar with the property, which was so helpful. We did large arrangements on the wine barrels, a light ombre pink rose petal aisle for us to walk down, and white hydrangeas in mason jars for all the outdoor tables She created the most incredible bouquet for me with shades of white, ivory and blush; she used white hydrangeas, champagne and ivory roses, blush garden roses, white anemones, and even surprised me with peonies since they were out of season and knew how much I loved them. Food tasting was the best part of wedding planning! We found Judy from Giorgi's Wedding Cakes. There was a lot of pressure to pick the perfect cake because it's my mom's favorite part about a wedding. We went a three tiered cake with different flavors: red velvet and carrot cake. Judy's cake was seriously the best tasting wedding cake I've ever had (and I'm not even being biased!). Our guests loved having the option to choose a flavor (or had both!). I've never been a huge wedding favor person but felt like it was something we had to do, so we picked up some local honey and me and my bridesmaids poured the honey into jars. We had a polaroid guestbook that each guest took a selfie and left us a little note (warning: by the end of the night the selfies got better and better...we know who you are ;-)) My artistic sister and MOH, burned wood and carved the cover for our polaroid guest book, which is incredible (pictures below!). All of the chalkboard signs was a DIY project. I found frames from an antique fair and spray painted them gold, then got wood cut from Home Depot for the inside of each frame, then spray painted that with chalk board paint. My amazing cousin Angelica wrote on them with a chalkboard marker because let's face it, my handwriting skills are just not up to par! Everything at our wedding was truly amazing and transformed the space, but what made our wedding was the infinite amount of love that filled the room. Make sure to check back tomorrow for my four favorite moments.